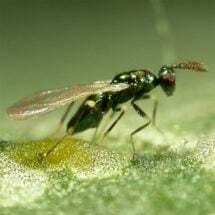 This tiny parasitic wasp kills leaf-miner larva in the mine and lays an egg on it. 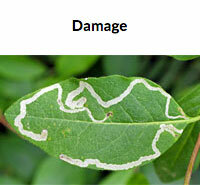 Damage from leaf miner larvae — the tunnels or mines that scroll across leaves — is easy to spot. 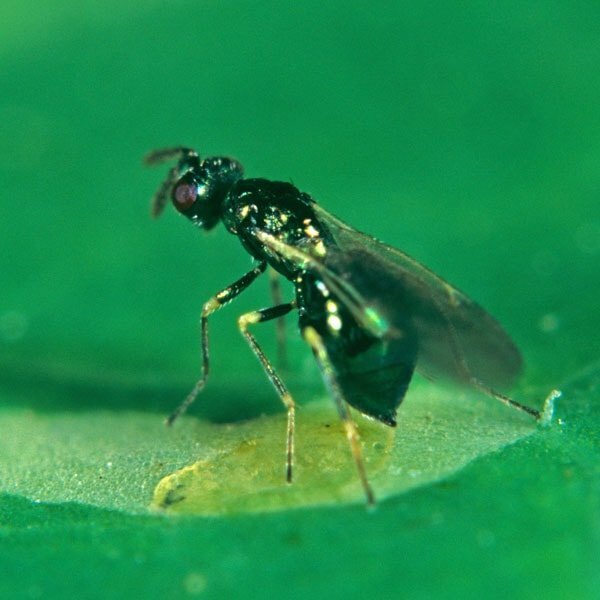 The leafminer parasite (Diglyphus isaea) is a small, black, non-stinging wasp that searches out leaf miners on which to lay its egg. 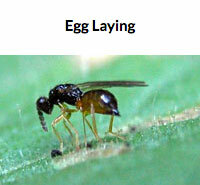 The wasp kills the leaf miner as it lays its egg, and the emerging larvae use the dead miner as food. The adult parasite exits the tunnel sometime later and will then go on to lay 200 – 300 eggs during its nearly month-long life. 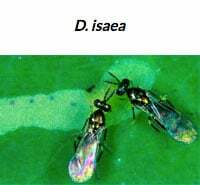 While destructive leaf miners often survive pesticide treatments because they are protected inside the tunnels, they cannot escape the parasite, which raps its antennae on the mine to locate the miner. Leaves with short or dead-ended mines often indicate the presence of D. isaea. 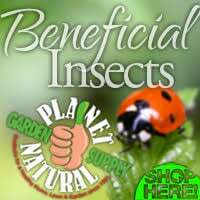 Shop our large selection of biological controls, including leaf-miner parasites, at Planet Natural. One bottle — 500 adults — treats up to 20,000 square feet and costs $234.95 with UPS Express shipping included! Make introductions when leaf miner infection increases. Apply in the morning or evening between the leaves on plants. Each 100 ml bottle (500 adults) will treat 5,000-20,000 square feet, depending on pest levels. Note: Adults are 2-3 mm long, metallic green and have short antennae.